For retail stores and restaurants whose bread and butter is flexibility, simplicity, and customer comfort, there is now a single lighting control solution that delivers dependable results day in and day out. The Lutron LCP128 lighting control system offers complete control of all lighting circuits-both switched and dimmed-in one simple panel. The implications of this system for retail stores and restaurants are enormous - Now it's easier than ever for managers to create the perfect conditions for any setting-from full light in work areas, to softly dimmed scenes on the floor. Store and restaurant owners appreciate the simplicity and flexibility of the Lutron LCP128 solution - They can select indoor and outdoor lighting patterns according to their daily operating schedule via a built-in astronomical time clock. Or, they can incorporate occupant sensors, daylight sensors, and manual wall stations to meet any specific requirement. 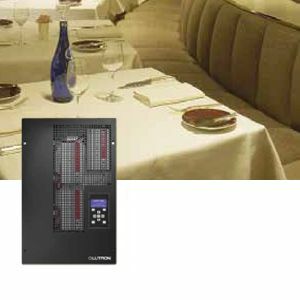 The Lutron LCP128 lighting control system also enables users to override easily a scheduled lighting operation via a built-in menu-based LCD programmer or up to 32 digital remote-mounted wall stations. In all, the Lutron LCP128 solution provides digital control of up to 128 circuits in up to 8 wall stations. The Lutron LCP128 solution also facilitates the installation of a comprehensive lighting control system. Now, only one panel must be installed to meet both switching and dimming needs. All panels are pre-wired to reduce installation time and material cost. Plus, the LCP128's integrated panels help eliminate redundant hardware and allow electrical contractors to install fewer components. In addition, the Lutron LCP128 lighting control system has a variety of built-in features to ensure ideal lighting conditions. The dimming modules feature RTISS ™ (Real-Time Illumination Stability Systems) technology, which filters out line noise to the dimmer to ensure consistent, quality dimming performance. Lutron's arcless Softswitch ™ technology provides million-cycle reliability on all 16A relay modules. The Lutron LCP128 system is available from lutron lighting | uk online shop www.onidserv.com/lutronshop/ - UK Online Store providing system design and direct deliveries through out the UK and EU countries.